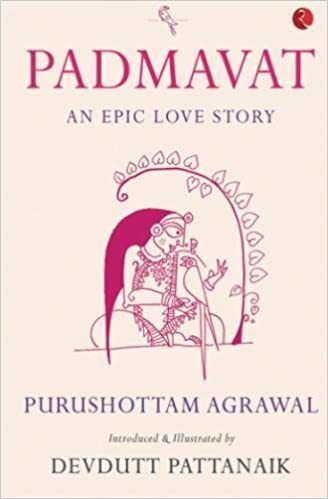 Padmavat by Purushottam Agrawal (Book Review: 4*/5) !!! Almost all of us have seen the movie “Padmavat” starring Deepika Padukone playing the character of Queen Padmavati. The debate has always been about the existence of any such queen in the past and regarding her association with Alauddin Khilji. Many people believe even the existence of queen as a myth as multiple authors/poets have written about this story in their own version and each one of them have their perspective defining the characters of the story. I never knew that I would end up reading a book on the same after watching such a grandeur movie on the subject and knowing everything in detailing. I am just done reading the book named “Padmavat” which calls the story as “An Epic Love Story” on its cover page. It is written by an already renowned author, Purushottam Agrawal. The book is introduced and illustrated by none other than the legendary, Devdutt Pattanaik. The author talks about the poet, Jayasi’s version of Padmavat written in the 16th century. I have for the first time in my life read such a book where an author is describing a story from another author’s point of view. Rather than just narrating the story, author also keeps discussing about the author’s point of view of the story. This is very incredibly handled by the author, Purushottam, where he never bores you with the history or myth or quotations but keeps you engrossed so wonderfully throughout the book that you want to understand Jayasi’s point of view on every scene of the love story. The introduction of the characters is nicely crafted which gives a good momentum to the story later on where the author gets a mileage to complete the whole love story in few pages itself. The good thing is that author has not tried to portray any character as good or bad but only talks about the nature of each one of them which defines what kind of choices and decisions they take later on which changes the whole course of their life. Author has also shared the original stanzas from Jayasi’s poem which also gives soul to the book as reading those original lines gives us more perspective in the language itself. The best about the author’s style of writing is that he does not stretches any part of the story and keeps everything short and crisp. Hence a book on historical, mythological and spiritual context- all embedded in one, gets over within 200 pages itself. I give this read 4* out of 5. This book is definitely recommended and has re-reading value. Kudos to the author for handling this form of writing so nuancedly. There has been quite chaos in m organization recently due to the performance incentive that gets distributed among the employees as per his/her monthly/quarterly performance. There are certain parameters on which an individual is tested and evaluated. One of the important parameters is “Multi-tasking”. I do not know why but I have never understood what someone means when he/she utter this word called “Multi-tasking”. Does something like this even exists? I have often heard people describing someone as Multi-tasker. And anyone who is described with this word is believed to be very smart and a hard-worker who keeps on working irrespective of whatever is going on in his surroundings. To be called and defined with this word, I have seen many people slogging immensely and trying to get into this meritorious club. I have also seen patient and great performers lose their credibility and quality of work because of trying to be something which is not even relevant for them to be. People generally consider their Managers to be a multi-tasker considering that they do several and different kinds of activities and work while they sit at a desk and do only a similar kind of job. People respect such people more because they know that when they are given 2-3 works simultaneously, they get so bewildered that they are unable to manage the same while their manager is accomplishing such targets on daily basis without getting pissed off. But is your manager or anyone really doing multi-tasking? This is something that needs to be observed rather than running behind something which is unachievable. Any person an only execute one task at a time howsoever genius or super-human he is. This is the basic truth. Suppose I am sitting in an office and writing a User manual for some software. I have just received a call from my client and he ask me to reply a brief mail on something for which he needs clarification. At the same time, I see that my Chat box on desktop is pinging where a colleague is asking me to send him a file we prepared together last week. Now, if someone is witnessing me from behind and finds that I have finished all the three tasks within next 7-8 minutes, he deciphers that I am a great multi-tasker and the word of mouth spreads. But what did I exactly do? I have only done one job at a time considering the amount of time each task will take me. I determined that sending the file to my colleague will take only a minute so I search a file for him even though his request was the latest one that I received. I have finished one task. Now, as I know that writing a User Manual is an endless task, I check the client’s mail and revert back to him in next 5 minutes. And now I am back to writing User Manual which I end up finishing by the end of the day. I have actually done one task at a time. Isn’t it? Then how am I a multi-tasker? A Multi-tasker must be someone who is able to use his super power skills and execute all these three tasks at one go. And believe me or not, just to be associated with this word, people are seriously trying to do this and ending up as a failure in not only doing this but in their overall career because this is something which you can never do skilfully. Any work you do, either big or small, needs your complete attention. There may be a few geniuses in this world who can execute two difficult jobs at the same time. They are definitely a multi-tasking hero but it has taken them a lot of practise. Also, whatever two or three tasks that they are managing to do at once, these are the only specific tasks that they can multi-task. If you will assign them some other work/job for multi-tasking, they will fail. You may give me an example that I can write this blog even while talking with a friend for two minutes on mobile. Surely, I can. But if you will observe in the end, I will have to recheck the two sentences that I must have written while talking because it has not been written with complete attention and concentration. You can only perform one task at a time brilliantly otherwise you will end up being an example of mediocrity forever. That’s the reason it is being asked not to talk while driving, chit-chat while writing/learning something, eat popcorn while watching movie, concentrate on the song playing in your headphone while crossing road etc. Because your brain will end up giving priority to one task over another automatically which is not in your control and you will end up in a mess with both the tasks incomplete and delayed.